Chairman Edwin Booth was awarded a highly prestigious Variety Legends of Industry award on Wednesday 2 November. 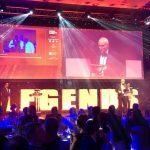 The Legends of Industry Awards celebrate those who have achieved outstanding success in their chosen fields of business, sport and industry. In addition to the awards ceremony the event featured a charity auction and raffle which were a great success, raising thousands of pounds for sick, disables and disadvantaged children in the North West Region.